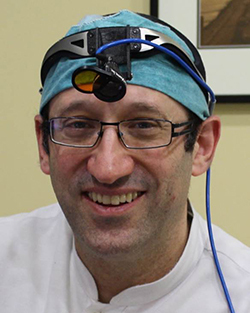 Dr. Gary Fortinsky is both a dentist and a licensed homeopath. He graduated from the University of Toronto in Dentistry in 1992, and became interested in finding more tools to help his patients. His first homeopathic course was in Chicago at the Dental Seminar in Homeopathy in 1994, but he found that three days, once a year, was simply not enough to satisfy his quest to learn. He subsequently enrolled in the Canadian Academy of Homeopathy in Montreal, and completed the three-year course in Advanced Homeopathic Prescribing taught by Dr. André Saine in 1998. Since the inception of his private practice in 1997, he has been an active participant discussing the many controversial issues surrounding current dental procedures, including mercury amalgams, fluoride use, and root canal therapy. He dispenses homeopathic remedies on a daily basis in his dental practice, which is located in Toronto, Ontario. Click here to view the course on Homeopathy and Dentistry that Dr. Fortinsky has partnered with WholeHealthNow to present.